There’s something charming about the word ‘enlightenment’, gently implying the expansion of one’s intellectual awareness, the acquisition of knowledge. It is a soft word, difficult to imagine ever being spoken in a negative sense. Indeed, enlightenment translates into the Sanskrit word prajna, describing wisdom and understanding, which is one of the fundamental endeavours of Buddhism. And no one can ever accuse Buddha of being harsh. That it is used to distinguish an entire period in history, therefore, is particularly pleasant, indicating an amiable era of innovation and comprehension. The Age of Enlightenment was a time of great change, of scientific awakening, and is arguably the greatest historic demarcation point since the birth of Christ. And the fact it all started in France is something the French are justly proud of. Perhaps the greatest monument to that epoch is Bordeaux, a city that blossomed in its role as a major European port during the Enlightenment’s tenure in the 18th century. Indeed, it is a place of great significance for the development and exchange of modern ideas and values, while its architecture and form reflect the culture of humanism and intellectuality that defined the period. UNESCO recognised this fact by designating the entire city a Cultural World Heritage Site on 28th June 2007, which, at 1,810 hectares, makes it the largest urban site on the organisation’s list. Listed amongst Bordeaux's attractions are 347 monuments, three churches, and a 150 hectare site in the centre of the city, meaning all of these are protected by special planning restrictions that ensure their continuance. Nowhere can all of this be better appreciated than the must-see the water mirror that sits in front of the magnificent 18th century Place de la Bourse, a large rectangular platform covered in a shallow film of water that creates a perfectly still reflective surface, enabling the appreciation of Bordeaux’s architecture both upright and upside down. 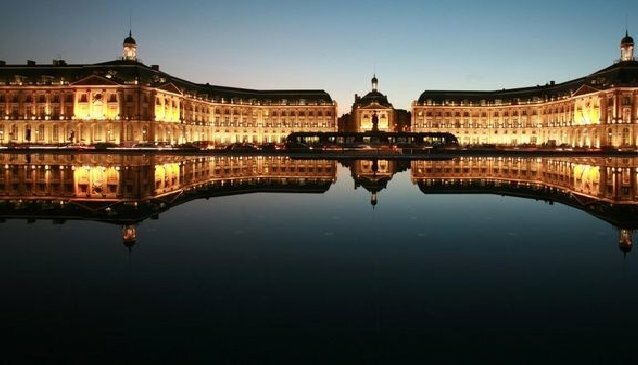 The influence of the Age of Enlightenment on Bordeaux’s architecture is exemplified by the classical and neo-classical influences in the construction of many of the city’s buildings, along with the coherent planning that binds the entire place together. The result is an urban area that feels at once peaceful and dynamic. Having said this, there are also a number of buildings which predate the 18th Century, such as the three churches that stand on UNESCO’s Routes of Santiago de Compostela: Saint-Andre, Saint-Michael and Saint-Seurin. Saint-Andre Cathedral is also known as Bordeaux Cathedral, a gothic edifice built between the 12th and 16th centuries, looming over the city’s old town like a stone guardian. The Basilica of Saint-Michael began construction later than the cathedral – in the 14th century – though it is similar in its gothic design. It features a striking pulpit depicting Saint Michael himself mercilessly slaying a dragon, along with an iconic 114 metre bell tower that reaches skyward like a rocket waiting to launch. Finally, outdating the lot is the Basilica of Saint-Seurin, the oldest of Bordeaux's churches. It is an astonishing feat of engineering, given that it was built in the early 6th century, and adds a rustic element to the city’s winding streets. It is not only architecture that registers on UNESCO’s radar, however: the organisation has recognised French cuisine as an intangible worldly treasure, which, coincidently, happens to be one of Bordeaux’s favourite indulgences. Indeed, there are more restaurants per capita here than anywhere else in the country, thirteen of which have earned prestigious Michelin stars. Bordeaux's markets should be of particular note for those who wish to sample a wide variety of French foods; try the one in front of the Basilica of Saint-Michael for Middle Eastern and Arabic flavours, or the Sunday morning market near the skateboard park on the Quai des Chartrons for succulent seafood (the fresh oysters and Graves white wine should not be missed). While Bordeaux is, undoubtedly, the biggest draw for UNESCO enthusiasts in the southwest of France, there are a number of other World Heritage Sites in the region which should not be overlooked. Saint-Émilion, for example, is considered one of the most beautiful villages in the country, boasting a plethora of beautiful Romanesque churches as well as being surrounded by the lush vineyards for which Bordeaux is famous. Additionally, the caves of the Vézère Valley, near Montignac, give a fascinating insight into prehistoric history, especially the Lascaux Cave which showcases a number of breath-taking cave paintings. The best time of year to visit the region is from spring to early summer, when the weather is glorious and the flora profuse, or autumn when the vineyards are in harvest. This also ensures the region’s annual influx of French holidaymakers, which takes place between July and August, is avoided. June is a particularly exciting time to experience Bordeaux, when the Festival of Wine alternates with The Festival of the River, both of which are paradise for oenophiles.